If no calls means no sales, then you need turboDial. turboDial — 2 week Free Trial – Sign Up Now! turboDial uses Twilio to connect your calls and send/receive text messages. You’ll create your Twilio account as part of signing up for turboDial. turboDial is proven to help salespeople make more calls, have more conversations, and close more sales. Display Infusionsoft dashboard reports showing your sales team performance in real time, and see the full call and text messaging history for any contact. With turboDial you can contact every new lead when they are warmest – right after they “raise their hand” to express interest, whether that means submitting a form, clicking a link or reaching a lead score. Have conversations and close deals! Email, phone or text, it’s the conversation that matters! It’s completely web-based! No expensive VoIP plans, no hardware… all we have to do is get a $20 pair of usb headsets, and our sales team is ready to go! It’s allowed a small company like ours to immediately scale quickly. – Jeff P.
WOW, this is one of the MOST impressive in- and outbound dialing solutions that I have come across. 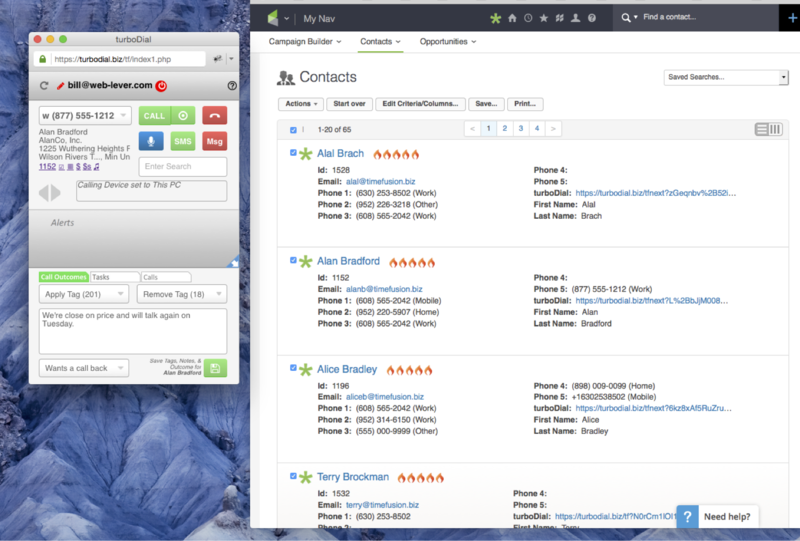 … Tightly integrated with Infusionsoft, it will be our work-horse when dialing prospects and customers and receiving inbound calls. –Gunnar L.
Just want say this app is a must if you are calling people; my results have increased by 35%. Everything is on just one click. This is most productive investment I made in my business. –Nadeem K.
I’ve tried 3 different dialers since becoming an InfusionSoft user and TurboDial is by far the best one of the bunch. 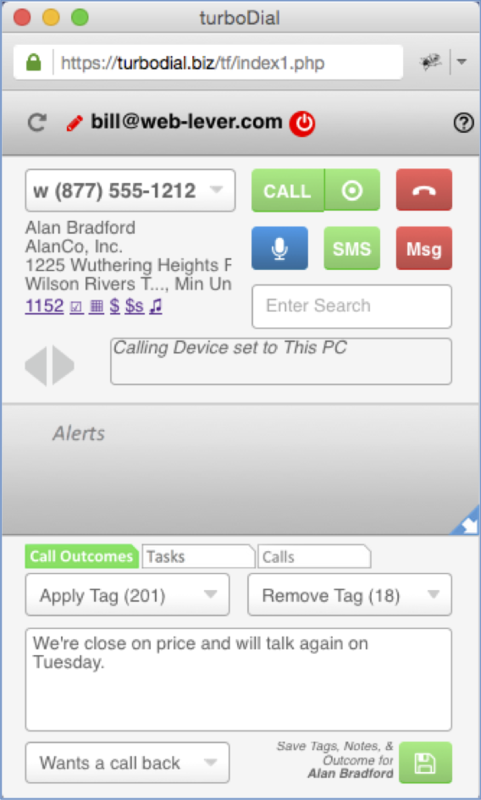 They have created an easy to use yet sophisticated system that has increased our calling and texting efficiency tremendously. It is also able to integrate reporting within InfusionSoft, which helps us keep track of each user’s progress and effectiveness. –Robert G.